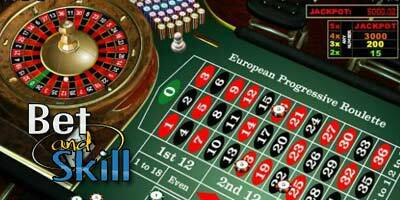 European Roulette is a very fun game played in casinos all over the world. The European Progressive Roulette retains all the classic features of Roulette yet adds an extra exciting sting in the tail in the form of a progressive jackpot. Play Progressive Roulette for free here and get tons of no deposit bonuses offered by the best online casinos. If a number hits on 2 consecutive spins, you win 15 credits. If a number hits on 3 consecutive spins, you win 200 credits. If a number hits on 4 consecutive spins, you win 3,000 credits. If a number hits on 5 consecutive spins, you win the entire progressive jackpot. This can mean many thousands, even hundreds of thousands, of credits. Gala Casino: claim your free spins, no deposit bonus or welcome package here! Williamhill: claim your free spins, no deposit bonus or welcome package here! Rules for the Progressive Roulette are the same as for the European Roulette. - There as many numbered pockets as in the European Roulette ranging from 0 to 36. - 1 credit on the table. French Roulette: what are "En Prison" and "La Partage" rules? "Free European Progressive Roulette: play without deposit here"